Monson, C.M. (2013, December 5). Treatment of Veterans’ PTSD. [Radio interview]. CBC News Radio. Halifax, NS. Monson, C.M. (2013, December 5). Treatment of Veterans’ PTSD. [Radio interview]. CBC News Radio. Saskatoon, SK. Monson, C.M. (2013, December 5). Treatment of Veterans’ PTSD. [Radio interview]. CBC News Radio. Quebec City, QC. Monson, C.M. (2013, December 5). Treatment of Veterans’ PTSD. [Radio interview]. CBC News Radio. Gander, NL. Monson, C.M. (2013, December 5). Treatment of Veterans’ PTSD. [Radio interview]. CBC News Radio. Yellowknife, NT. Monson, C.M. (2013, December 5). Treatment of Veterans’ PTSD. [Radio interview]. CBC News Radio. Edmonton, AB. Monson, C.M. (2013, December 5). Treatment of Veterans’ PTSD. [Radio interview]. CBC News Radio. Calgary, AB. Monson, C.M. (2013, December 5). Treatment of Veterans’ PTSD. [Radio interview]. CBC News Radio. Vancouver, BC. Monson, C.M. (2013, December 5). Treatment of Veterans’ PTSD. [Radio interview]. CBC News Radio. Cape Breton, NS. Monson, C.M. (2013, December 5). Soldiers and PTSD. [Radio interview]. 680 News. Toronto, ON. Rouse, J., McShane, K., & Monson, C.M. (in press). 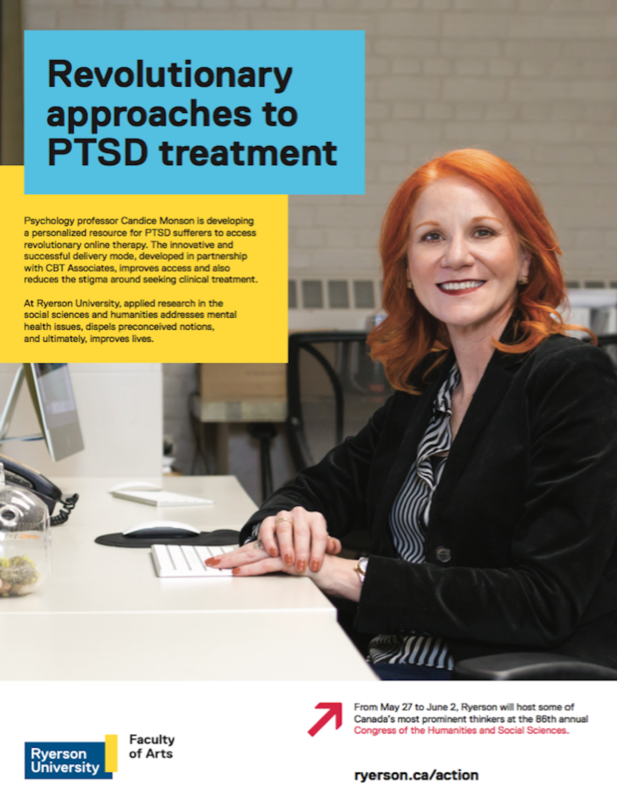 Providing psychological services and training in primary care: Ryerson University and St. Michael’s Hospital. Psynopsis. Findings from the Monson et al. (2012) randomized controlled trial of cognitive-behavioral therapy for PTSD were reported in over 60 media outlets, ranging from online and newspaper articles to live television. This includes coverage by U.S. News and World Report, ABC News, CBS News, the Boston Globe, the Los Angeles Times, Time.com, and WebMD. Monson, C. M., & Fredman, S. J. (2012, April- May). Cognitive-behavioral couple therapy. Four-part, web-based training on behalf of Massachusetts General Hospital Psychiatry Academy, Boston, MA.